Every financial expert would agree that saving money is important. While most people would also agree with this, it’s definitely one of those financial principles that are easier said than done. The majority of individuals that do save money, usually only have one savings account. Unfortunately, that’s just not an efficient way to save money, especially if you have several financial goals that you want to reach. In Part 1 of this post, we’re going over two of the most important savings accounts you need. In Part 2, we’ll cover the other three! The first savings account you need to start focusing on is your emergency fund. Dave Ramsey fans know this concept all too well. In fact, when I first read Ramsey’s famous book, I thought he might be reaching a little too far with his theory that individuals see an increased amount of financial problems – i.e. car breaking down, unexpected doctor visit – when they don’t have an emergency fund set up. However, I definitely have experienced this to be true in my own life. As newlyweds, the thought of having $1,000 saved for emergencies seemed too hard. At the same time, it seemed like we kept getting hit with fees and unexpected costs every week. As soon as we pushed ourselves to get $1,000 saved in our account, it felt like we weren’t drowning anymore. I would say that the financial issues went away completely, but that couldn’t be further from the truth. We’ve had many unexpected emergency costs throughout the years, but they all seem manageable and stress-free since we know we have the savings. Before you save money anywhere else, save $1,000 in your emergency fund. Eventually, you’ll want to grow this to 3-6 months of wages. No matter how old you are or what job you have, it’s important to start putting money into a retirement account. I have seen the carelessness of people both young and old when it comes to retirement. I have friends who haven’t started saving for retirement because they’re still young, they don’t have extra money, and they’re not in their dream job yet. If my husband didn’t currently have our retirement savings deducted from his paycheck, I would also say we don’t have enough money to save. For many of us, it will never be the ideal time to start saving, but it’s during this time that we need to learn how to live on 70-80% of our paychecks so we can save the rest. It’s not easy and takes a lot of sacrifice: it might mean downsizing your home, giving up extra activities for your kids, or eating more simple meals at home. You’ll thank yourself later. Or you can end up like a loved one I know that’s 53 and has no retirement savings. I pleaded with him to sell his home and move to a smaller place. This would enable him to make maximum contributions to his 401(k) for the next ten years so that he could at least benefit from some earned interest. He’s still unwilling. He thinks he’ll be able to work well into his 70s. Even if you love your job, you never know what might happen that could affect your ability to work. The bottom line is: don’t take your retirement savings lightly, no matter how young or old you are. 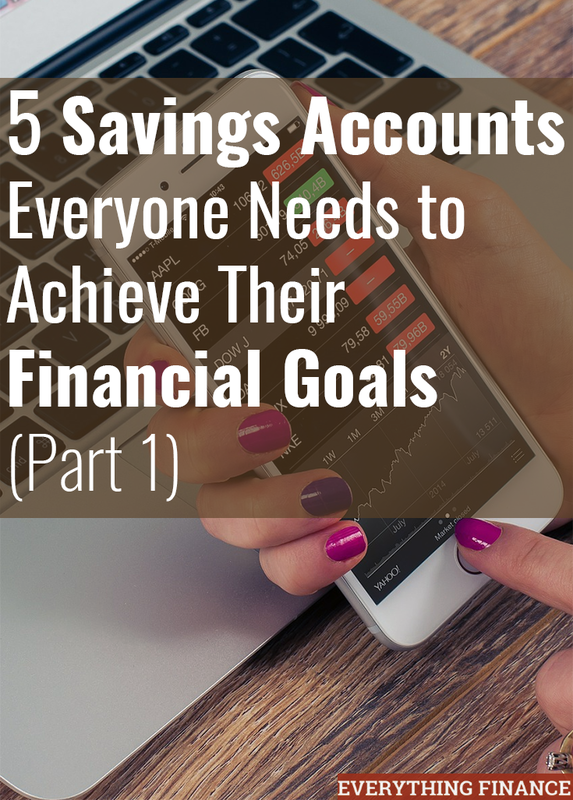 In Part 2, I’ll talk about the next three savings accounts that you must have to reach your financial goals.